Confession time yet again: Unlike Nathan and most of the Western world, I'm not a big pumpkin fan. At all. Truth be told, and I realize how deeply I may offend you by saying so, but I really don't get the big fuss about pumpkin this and pumpkin that this time of year. Wanna know something crazy? You know what a pumpkin all by its naked lonesome tastes like? NOTHING. It's all the pumpkin pie spices y'all love - the cinnamon, nutmeg, allspice, cloves,whatever else. I'll enjoy a piece of pumpkin pie every once in a while, but everything else - your lattes, your pancakes, your mochi (for goodness sake) - you can have them. All of them. Consider me the anti-Linus, a pumpkin agnostic not personally believing in any Great Pumpkin and lacking any faith in any sort of all-powerful, all-good gourd. This time of year, give me a honeycrisp apple straight from the tree, and that's what fall tastes like to me. Another favorite autumn taste: ginger cookies, much like some spiced wafers my dad always seemed to pick up to pair with some apple cider. It was only because of those memories that I was personally willing to give these Trader Joe's Mini Ginger Pumpkin Ice Cream Mouthfuls a try. Man, oh man, oh man....am I glad I did. These ice cream cookie sandwiches are just about the tastiest dessert I've had from TJ's in a while - even better than that key lime pie I was raving about a couple months back. Not a single complaint from me at all. Much like their semi-minty predecessors, the dominant flavor for these beauteous bites is the cookie itself - soft, a little chewy, super gingery. Perhaps not as gingerish as the triple ginger snaps (the bomb) but close. For a guy who likes ginger as much as I do, they're the idea framework for a tasty little treat. The pumpkin-pie-ish ice cream (not too far off from the Pilgrim Joe variety, if I remember right) is a perfect counterbalance, offering a soft, creamy, kinda sweet kinda spiced filling, that in both texture and taste melds perfectly. For a little extra oomph, let the ice cream get just a little bit melty for a little extra soft creaminess - you won't be sorry. I love the fact that these are are as small as they are, too. For such a rich, vibrant tasting treat, a normal sized ice cream sandwich would have been too much. When TJ's says "mouthful" here, it's meant quite literally - if I didn't have to worry so much about making a good example for my super-observant two year old, I could easily chomp it down without taking the two or three bites I did. Because they were so small, I can also tell myself they were a "not that bad of a diet cheat" to eat just one (a serving size is two), though, really, I know, that's somewhat debatable. I've tried pretty hard to come up with any sort of reason to dislike these even a scintilla. I can't. Neither can the wife. If every thing with pumpkin tasted this good, I'd be a much different man. I'd be a believer. Count me in as a pumpkin agnostic, too! So I completely relate about getting the shocked looks from everyone when I reveal that about myself. But these sound delicious, esp. since I love ginger as well. I must try soon! Usually you are right on the money, and I use this site as a TJ "bible" (and will continue to) but I personally didn't care for this at all. The ice cream was way too sweet, and the pumpkin flavor was artificial tasting (even though I know it's not). Also, the cookie was mushy. I tried one, and they went straight into the trash! One year later, they are back in the stores, so I got a box. The texture was very off, with the cookie part being gummy and the soupy ice cream never getting cold and firming up despite days in the freezer. The sandwiches stuck to each other and were difficult to separate without damage. The taste was good, though. 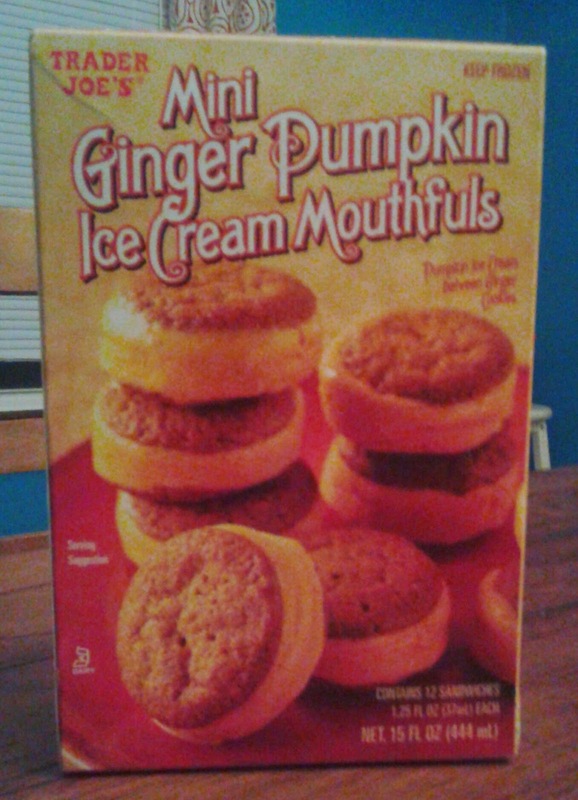 If you like it, I recommend buying Trader Joe's Pumpkin Ice Cream and Triple Ginger Snaps. The cold ice cream plus crisp cookie is way better! It's also a better deal.